So who else didn't get 500K in points for armor equipped? I only got credit for 3 of 4. I will be a week before someone in support looks at the ticket, so I guess it's just another busted promise for this raid. Been sitting here reading everything and I figured out what's going on. Players who are having long repair times are Non-Coiners. Player who are have Instant Repair Fleets are Coiners and Whales. I you don't coin to get the 30 min to 5000 hour repairs. If you coin your sucking Kixeyes dicks the right way so they give you Instant Repairs. Enough said. guide section shows exactly what i've done and how. note i said 1 tank. no need to follow good advice that would reduce your seat time if you dont want to though. its your choice. it's the arrogant attitude that you think everyone has all the same toys and access to your token generator that pisels people off.... you use stuff most cant get to... try doing some lesser builds with second rate gear and do as well then you would have a loud following even i would join ..
Kixeye has created the WORST raid circumstances I've seen in six years of playing. These targets are all but impossible to destroy with anything but the stated weapons on the event splash screen. I will not waste one coin on this one. The lowest level target cannot be completed unless you have the suggested hulls and weapons. Countermeasures have no effect. I agree that challenge is part of the game, but come on guys! Only the most elite players, with the latest hulls/weapons/specials/armors, and weapons. Countermeasures have no/minimal effect. I agree that challenge is part of the game, but come on guys! Only the most elite players, with the latest hulls/weapons/specials/armors, and a big pocket full of coins give you any chance of success. I will NOT play it. You forget about the 1st Scourge raid, where some prat at Kixeye suggested such-a-such V2H build complete with R16 (!) tech. I find the PACs on the buc to be basically worthless, my ship's combat speed of 71 looks like 20, the ship looks like a bloated whale on the screen, should go on a diet and be more streamlined if it's a ballistic ship. Took 4 PACs off, added 2 mausers and 2 bypass chainguns, added shieldtac, autoloader 3 and even with the charged armor they melt in the fire field, even more so being hit by a ballistic cannon. Done with this raid, way too much damage thanks to Kix nerfing the charged ballistic armor and increasing the damage from turrets. Figured they increased the damaged and reduced the armor so someone could buy a new Ferrari to cruise around in or pay their California rent. I'm spending my time refitting other ships, started playing this game in 2011, wonder if it's time to take an extended break again. & how many tokens or coin did that cost? guess i'm an anomaly, i'm using my ironclads from a year ago with no charged armor, no countermeasures and no crew and am autoing the 60s. i'm doing 3 full sets for 5-6 hrs repair for roughly 3 mil points using the build recommended on TFC a year ago for doing the raids then. i do have some tokens saved so am going to instant refit them to include shielded tactical system and 1 each phalanx and trident to cut down on damage hopefully. working on a buccaneer fleet but it's not ready yet. maybe next month. 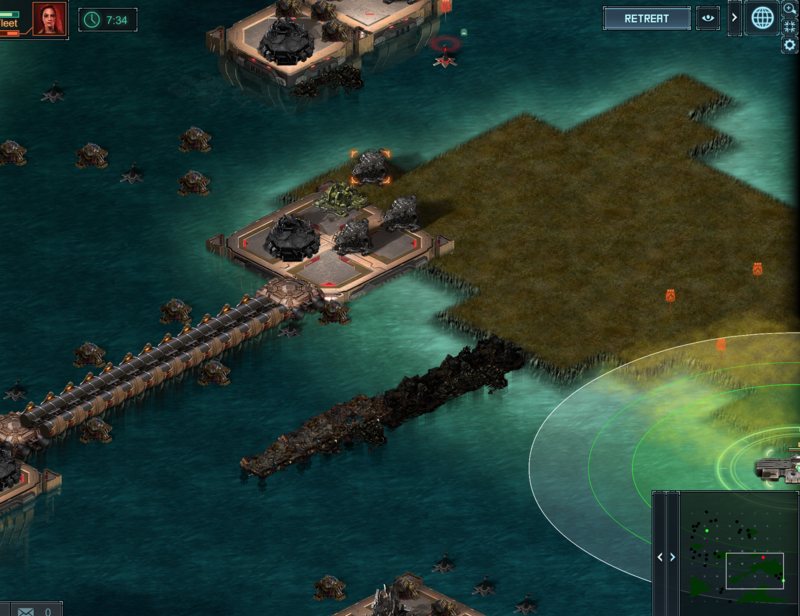 Same here, using a fleet of ironclads with mauser cannons, and a Zelos fleet with quake cannons. can even throw in a Zelos into your ironclad fleet, that can offer some of the countermeasure defence that you clearly looking for I'm shocked at how many people here DON'T have a Zelos fleet built considering the ships do so well in FM, normal and uranium bases, and lower end scourge grid targets...or maybe they do but haven't decided to think outside the box? I'm betting you have Siege Battery 3 on them instead of Siege battery 4. Evidence and a series of as-yet-unanswered complaints suggest that SB4 is glitched and isn't provding its turret defense bonus. you were spot on about siege battery! when i refit my ironclads i switched siege 3 out for siege 4. that was before i saw your post. wow! i went from being able to do 3 sets down to 1.
i luckily had enough tokens to be able to switch them back. am now back to doing 3 sets before repair. Thank @SIF who did the hard work. I just talk a good game. Not a fan of narrow channels and water areas that are blocked. Click on water to move your fleet and it stops because the water is actually obstruction. More careful design and testing was required. When will you fix the auto in the 85? You have to retreat and then reenter to clear the last target - the fleet does not respond to any commands just sit in the bottom right hand corner. I hate to say this but after 5 years of playing game, unable to get anything for next event to help me with 3 bucs. So I would have to say that puts me out thanks kix. Will someone please tell Kix to fix Siege Battery 4 so that it WORKS already? I use them on Buccs and at this rate I'm not going to be any more prepared for the next one. so, turns out the raid is pretty simple, as long as you built basic buccs following anything posted on TFC. Hi Bort, i think you might have the knowledge to explain why this blitz is trying to cost me twice as much? I don't have the time to grind this weekend, and don't have buccs or hydras, so the level 69's were my best bet. dont' know sorry mate. 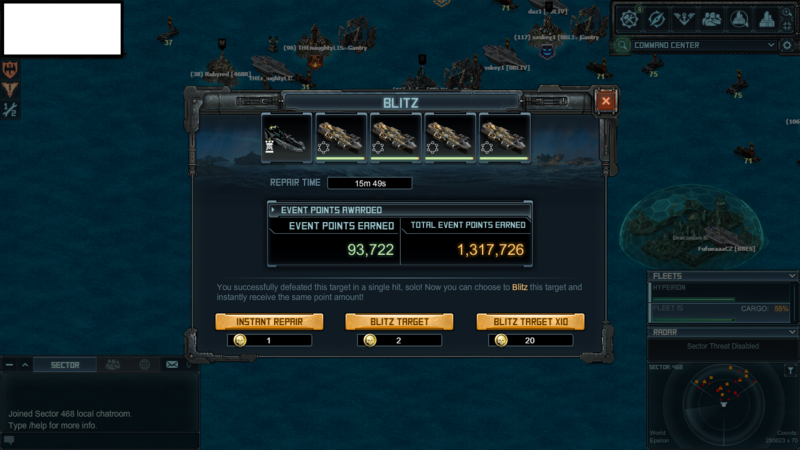 i dont coin so dont actually hit the blitz targets at all. Siege Battery 3 appears to be just as broken as Siege Battery 4, so if this is consistent, I'm thinking it's a path/timing problem. If SB4 drops a turret and gets you moving and stopping sooner, you may be stopping in fire while the situation with Siege Battery 3 may be your ship is still moving when the launcher is reloaded and firing again, thus no stopping in the fire. If you want to see an increase to your turret defense with only a minor decrease to building damage, give Garrison Battery a try. I think everyone needs to give it a chance and work on your driving. It's tough, but not as bad as everyone makes it sound. I wouldn't call it hard work. Just expensive if I hadn't had lots of free tokens to waste to play with. Except for pausing recording to quickly prep the first cluster with my Bucs, you can see everything I did from the instant refits to my old DUB ICs to looking over the repair times in under 6 minutes. Whose SY ever has enough downtime to waste 3 to 5 days just to show 1 or 2 specials' retrofits are broken? That's the headache. Heck, it's only luck I still had these to do the test rather than scrapping them to make room in my Dock. Thanks should also go to @Templar614 and a few others who have pointed out these specials were broken in PvP base hitting. My contribution is just adding on to their tests to show this problem may be game wide. Understand, my video basically shows the retrofit upgrades not applying AT ALL. The 40% damage reduction numbers I calculated for SB3 and SB4 are the R0 values even though mine have been at R15 for a long time. But I've seen Writs w/ SB3 at less than R15... They do even worse, so it's as if Retrofitting up to R15 is just to get you back up to the stated R0 level. I now can see why the Bucc S targets weren't available for the preview and why the raid info was out so late. I wonder how GDR could go on TFC and say (with a Cheshire Cat grin) the team was going to try and make 2018 get back to the fun game it used to be. He told us that there were a lot of mistakes made in 2017 and the team had learned from them. What were those mistakes? Not squeezing every last bit of money they could out of every player that remained after how crappy 2017 was? 2018 may well be the last straw for this game if these first two weeks are any indication of the "new direction" the team is taking. I don't have the Bucc I am in the process of building Hydra's, but they will not be ready until the next raid or possibly the one after. So cannot voice an opinion on the S targets. I am hitting T6 targets, with either IC's or Zelos, the zelos fleet is more fun to use, but needs some tweaking, at the moment I am using two zelos fitted with quake cannons + a zelos filled with antis. its suffering against the fire fields, so i am going to put a frosty in with them to see what that does. My biggest issue (accepting that the raid targets are generally over the top) is that the footprint of the buildings causes the narrow channels to be even narrower, in some of the targets the footprint of the oil rigs extends 3 millimeters beyond the rig itself. Its bad or lazy designing, and is an example of the lack of care approach that dogged 2017. Kix wants/needs us to pay them our hard earned money, kix needs to step up its attitude big time and start treating its customers with some respect, otherwise they will loose more customers and that can only result in one thing, some of the staff being laid off. Unfortunately the staff that need to be laid off will be the last to go. I gotta wonder how some of us non-coiner and lower level players can fare very well anyway. The 41 targets are almost non-existent. Having to travel 1-2 minutes to get to a target that you can't guarantee will still be there when you arrive is a little frustrating. This raid is bad enough already. So why not add to the problem. you have r and c armor on them ?? also phalanx needed on them ? Well ironclads with normal build, ballistic armour is doing quite well in the 60's. I'm enjoying this raid. I put this in the event notes thread but will added it here as well. The problem with the locator showing the wrong tiers has been corrected. **** dude, why waste time on something that unimportant? Hahahahha... that would be the first time, Kix fixes something that players are complaining about? Real issues - such as the increased damage, nerf of armors, auto not funktioning (ships allways go solo - thus destroying the very idea behind an "auto" hull). Non of the issues that matters EVER get's fixed. Just check how well SB 3 or 4 works, compared to FLCS? It should work the same, but the frontline covers the 50% that it actually should. SB only 38%, so all the retro's we have paying TONS of uranium for, doesnt work at all. Known issue this whole month - and NOT fixed, because that would make KIX loose coin. Ok, i assumed i was being negative at first, but now 100% the buccy s target has had extra tac fields added to the first straight. The charged armour goes instantly on that middle bit, and then damage ensues very fast. Stop fiddling us. Kix for the sake of transperancy please officialy confirm on a pinned post that difficulty of the hydra's lair campaign was raised comparing to first day of the raid and please provide an explanation to this change. same fleet on lots of repetitions now take much more dmg. i think the change was that the targets are tougher and it takes double volies of fire to kill them so i am exposed double the time to their fire and get alot more dmg. i dont know if this change was made only to hydra or also to bucca and other set targets. We are making a series of changes in January’s event “Zoe’s Gamble” based upon your feedback. Any player who had the C1-C charged armor equipped on a hull prior to the announcement of the armor change is going to be compensated 500,000 event points per armor equipped as compensation for the changes. These will be compensated by end of day tomorrow. The points paid out for hitting the Tier 6 and Tier 5 Targets is going to be increased for higher level players. The 25% discount on the price of the Hydra Siege Cruiser will remain discounted for the entire duration of the event now, instead of only for the first 36 hours. Thank you again for all of your feedback.